The Minnesota Builders Exchange (MBEX) is a progressive, non-profit trade association. As a member-based organization, their builders exchange exists only because of, and for the purpose of, serving their member companies and their employees. MMCA is a service organization. That means exactly that: they provide services to their members through labor negotiations, government affairs, industry standards, industry promotions, essential training, and industry information. MMCA constantly explores ways to benefit their members so that their only concern is their business. 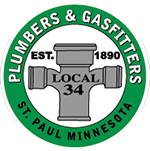 As a member of the Plumbing, Heating, and Cooling Contractors Association, we're part of the largest membership association in our field. The attendant networking opportunities and educational resources means we're always up to date on the latest plumbing techniques. The National Aging in Place Council® is a senior support network. NAIPC® was founded on the belief that an overwhelming majority of older Americans want to remain in their homes for as long as possible, but lack awareness of home and community-based services that make independent living possible. Our union was established to protect the workers in our industry. When workers join together, we promote better wages, better benefits and better conditions for all working people. 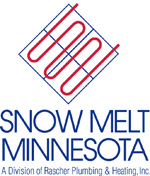 Snow Melt Minnesota is a division of Rascher Plumbing and Heating Inc.
Jason and Kip were on time, very friendly, and did an amazing job! Thank you so much. — Jen S.